Stephen Hopkins’ name is not one of the first names that comes to mind as a signer of the Declaration of Independence, but he does stand out in John Trumbull’s painting “The Declaration of Independence.” Hopkins is clearly visible in the rear, wearing a hat. He also stood out as an exceptional man, a colonial governor, educator, judge, merchant ship owner, surveyor and patriot. Stephen Hopkins was born on March 7, 1707 in Providence, Rhode Island, the son of William Hopkins and Ruth (Wilkinson) Hopkins. 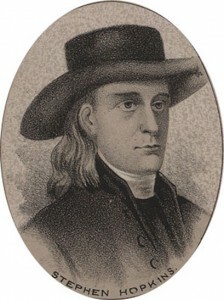 Hopkins’ great grandfather, Thomas Hopkins, was born in 1616 and came to Providence in 1641, having followed Roger Williams there from Plymouth. In 1651 he moved to Newport and was appointed a member of the town committee in 1661. His mother, Ruth Wilkinson, was the granddaughter of Lawrence Wilkinson, a lieutenant in the army of Charles I, who was taken prisoner October 22, 1644 by the Scots and parliamentary troops at the surrender of Newcastle-on-Tyne. Deprived of his property, he came to New England sometime between 1645 and 1647 and was at Providence in 1652. He became a freeman in 1658, was chosen deputy to the General Court, was a soldier in the Indian wars, and became a member of the Colonial Assembly in 1659. Stephen Hopkins was a cousin of Benedict Arnold, the famous Revolutionary War General who later turned traitor. Hopkins grew up on a farm in Scituate, Rhode Island. He had little formal education and his mother taught him his first lessons. His grandfather and uncle instructed him in elementary mathematics, and he read the English classics in his grandfather’s small but well-selected library. Hopkins married Sarah Scott on October 9, 1726, when they were both just 19, and they had five sons and two daughters. Sarah was the youngest daughter of Major Sylvanus Scott and Joanna Jenks. Her great grandfather, Richard Scott of Glensford, County Suffolk in England, was admitted to the church at Boston in 1634, but removed to Providence where he became the first Quaker preacher at Providence. He married Catharine Marbury, a niece of Anne Hutchinson who was banished from Massachusetts Bay for preaching the grace of God. Sarah’s mother, Joanna Jenks, was the daughter of Joseph Jenekes (Jenks) who at the age of two came to America in the James in 1635, with his father, also named Joseph Jenks. They came from Bucks County in England and the elder Jenks established the iron works at Lynn, MA. Jenks also cut the dies for the “Pine Tree Shilling” in 1652, built the first colonial fire engine in 1654 and invented the grass scythe. Hopkins earned the trust of his fellow citizens and quickly became prominent in local affairs. He became a surveyor and at the age of 24 was selected to moderate the first town meeting held in Scituate. In 1732 he became town clerk, and was president of the Town Council in 1735. He represented Scituate frequently in the General Assembly from 1732 to 1741, and was named Speaker there in 1742. About 1740 he joined his brother Esek Hopkins in commercial ventures and established his permanent residence at Providence in 1742. The two brothers established a mercantile-shipping firm and were actively involved in building and fitting out vessels. Stephen served in the General Assembly from 1744 to 1751, was assistant justice of the Rhode Island Superior Court from 1747 to 1749, and became Chief Justice in 1751. Hopkins was largely responsible for transforming Providence from a small village with muddy streets to a thriving commercial center. He was also instrumental in establishing Rhode Island’s present day boundaries. Besides his political and civic interest, Hopkins had interested in education and science. About 1754 he was influential in establishing a public subscription library, and he was the first chancellor of Rhode Island College, which was to become Brown University. He helped found the Providence Gazette and Country Journal in 1762, held membership in the American Philosophical Society of Newport, and was involved in erecting a telescope in Providence for observing the transit of Venus, which occurred in June 1769. Stephen Hopkins won the governorship of Rhode Island in 1755, and was governor several times through 1766, competing with Samuel Ward for the annual election for the governorship. Hopkins attended the Albany Congress of 1754 where he first met Benjamin Franklin, who promoted the Albany Plan for uniting the colonies. The plan failed, but Stephen and Benjamin became friends and were to become the two most elderly signers of the Declaration of Independence in 1776. After the passage of the hated Stamp Act by Parliament, Hopkins wrote The Rights of Colonies Examined, published in 1764, a pamphlet in which he attacked the Sugar Act and the Stamp Act, stating: “British subjects are to be governed only agreeable to laws which they themselves have in some way consented.” It predated John Dickinson’s more widely distributed Letters from a Farmer by three years. When John Hancock’s ship was seized by the British and sent to Newport, it was burned by an angry mob. Royal Governor Wanton received instructions to arrest those involved and to send them to England for trial. Hopkins, as chief justice, stated he would neither apprehend them nor suffer any executive officers to do so. At a meeting of the General Assembly of Rhode Island in 1774, Hopkins introduced a bill to prevent further importation of slaves and freed those slaves which he owned. Hopkins signed the Olive Branch Petition to the King in July, 1775, seeking a peaceful resolution of the colonies’ grievances. He arranged for his younger brother Esek Hopkins to become the first commander in chief of the Continental Navy. During the intense debate over independence that began on July 1, 1776, Stephen Hopkins provided a moment of humor. As thunderstorms broke over Philadelphia, John Dickinson was well into his second hour of speaking against independence. Suddenly, Dickinson’s talk was interrupted by a vigorous thunderclap which rattled the building. Hopkins dropped the hickory cane his head had been resting on, and looked about sharply. Stephen Hopkins voted to approve the Declaration of Independence on July 4 and signed the engrossed copy on August 2. He suffered from the “shaking palsy” which caused his signature on the Declaration to appear unsteady, and he used his left hand to steady his right. He stated at the signing, “My hand trembles, but my heart does not.” Hopkins’ palsy affliction was of long standing, causing him to rely upon a clerk to write for him in his businesses and public life. In June of the same year Hopkins was appointed to the 13 member committee (one from each state) to draft the country’s first constitution, The Articles of Confederation. His health failing, he returned to Rhode Island soon thereafter. Hopkins died on July 13, 1785 and is buried in the North Burying Ground at Providence. An extensive cortege and assembly of notable persons followed the funeral procession of Hopkins to the cemetery, including court judges, the President, professors and students of the College, citizens of the town and inhabitants of the state. The Rhode Island legislature dedicated a special monument at his gravesite in his honor, and it provides an elaborate testimony to the life of the patriot. On the west side the inscription says, “Sacred to the memory of the illustrious Stephen Hopkins, of revolutionary fame, attested by his signature to the Declaration of our National Independence, Great in Council from sagacity of mind; Magnanimous in sentiment, firm in purpose, and good, as great, from benevolence of heart; He stood in the front rank of statesmen and patriots. Self-educated, yet among the most learned of men; His vast treasury of useful knowledge, his great retentive and reflective powers, combined with his social nature, made him the most interesting of companions in private life. The home of Stephen Hopkins is one of the oldest buildings in Providence, and can still be seen at the corner of Hopkins and Benefit Streets. He lived in the house from 1743 until his death some 40 years later. The local chapter of the DAR saved the home from destruction in 1927 and moved it to its present location. Devoted gardeners surrounded the dwelling with a pretty vest-pocket park, designed by Alden Hopkins, a descendant of Stephen, and, in later years, the resident landscape architect at Colonial Williamsburg. Its clapboards are painted Spanish brown, and it is surrounded by governmental and college buildings, sharing the streetscape with Brown University and the Rhode Island School of Design. On his desk in the house lies a copy of the Declaration of Independence and a quill pen. 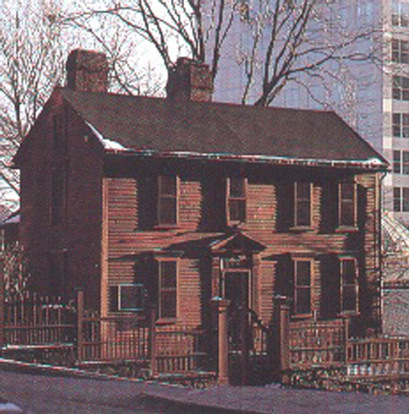 The home was built originally in the year of Hopkins’ birth, 1707, and was a small plain structure, typical of its time and place, with an end chimney, one room on the first floor, and a sleeping space above. In 1743 he began adding on a “big house” to the little house. By 1774 the view from his home included the new customhouse and his own warehouses and wharves, where his ships docked. In Washington D.C., near the Washington Monument, is a park memorializing the signers of the Declaration of Independence, and one of the 56 granite blocks there bears the name of Stephen Hopkins. Nearby in the Rotunda of the National Archives is the mural painting by Barry Faulkner showing a number of the delegates, and the figure of Stephen Hopkins is shown in the front row, the fourth from the left. In the Rotunda of the U. S. Capitol hangs the famous painting by John Trumbull “The Declaration of Independence.” The figure of Stephen Hopkins is shown standing in a group of three delegates in the background, wearing a hat. Barthelmas, Della Gray, The Signers of the Declaration of Independence, 1997. This entry was posted in Rhode Island, Signers by state. Bookmark the permalink. Enjoyed very much as I love revolutionary history of America. Newport was my home port while in Navy, and have been back several times over the years. This is an informative bio. I am a descendant of the Mayflower Stephen Hopkins and am curious to know if the two men are related. Does anyone know?